First Lines: We reach the lonely hilltop just as the sun sets over Verona. Golden light bleeds to a crimson stain that spreads across the city, dipping into every secret place, marking every shadow. Just as her blood seeped from her chest…spread out to coat the stones of the tomb. Cold, mute stones. They will keep my terrible secret. Juliet is dead, and her blood is on my hands. After being pleasantly surprised by the previous book in the duology, I had to give this a go. Besides, who doesn’t love when Romeo and Juliet involves immortals, good vs. evil, and more insta-love? Because of his actions, Romeo is doomed to spend the rest of eternity stuck inside a rotting corpse. But when given the chance to redeem himself, he jumps at the chance, even though it’s not going to be easy. He needs to travel back in time and save the life of Ariel Dragland. Unbeknownst to Ariel, she’s incredibly important to both the Ambassadors of Light and the Mercenaries, the two powers of good and evil. Romeo must make her fall in love and believe in love–all before her darker tendencies make her a target for the Mercenaries. 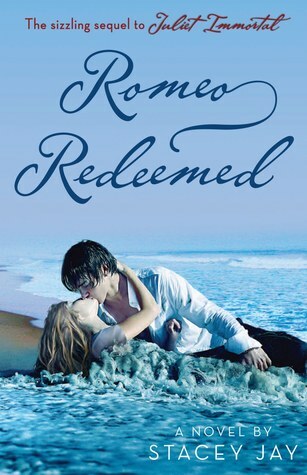 While it all starts as a lie, Romeo soon finds himself drawn to Ariel for real. Soon, he’ll do what is needed to protect her. But when Ariel is lead to believe that their love is a lie, her darker tendencies will put them both at risk and may end what they’ve started. Hmm. I’m a little disappointed that I didn’t like this as much as the first book, but at least I think I can articulate why. First of all, I thought it was nice to see Romeo’s side of the story. I liked seeing what was different, how things were flipped to fit his telling. He’s still a tortured, conflicted soul, but it was fun to get into his headspace for a change. The trouble with this story started quickly enough for me. Because Romeo’s trying to save a girl that didn’t survive the first book, we’re basically in a parallel universe. There are variations to the characters, to the plot, etc., from what we learned about in the first book. I’ve never been a fan of parallel universe stories. I like linear timelines. I like knowing that what I know about the story is true, not that it will be different in this world. It’s a little thing, but it bothers me. Look, I understand why changes needed to be made. In many respects, this is the same story as Juliet Immortal. Same characters, some of the same/similar events. If they weren’t changed, this would be incredibly boring. But as it was, I was still kind of bored by the whole thing. And obviously, the characters are incredibly impulsive. In order for two people to fall in love in 3 days, yeah, they’d both have to be pretty impulsive. It actually gets a little annoying that they don’t think anything through before they do it. I’m a planner and pretty much not impulsive at all. So yeah, it irritated me. Actually, what I ended up really liking were the very few scenes that happened in 1304 Verona, when the story jumped back in time. Those ended up being far more fascinating than anything else this story had to offer. So yeah, it may not have been perfect. It wasn’t even always interesting. But I can still appreciate how she put her own spin on this classic tale and reinvented it. I did enjoy that. I’m Holly and I’m a fifth year middle school English teacher who has not outgrown her love of Young Adult books. I love spreading my love of reading and YA books, which means that teaching is kind of perfect for me. A self-professed word nerd, I love the English language and really bad puns.